For many people, buying a diamond for the first time can be a daunting experience. With so many options, characteristics and price variations, it is easy to become confused and overwhelmed. At Diamonds and Pearls Jewellery, we will take the time to teach you the basics of what makes a diamond beautiful and explain why one stone is more valuable than another. With our onsite microscope and grading equipment we can show you the unique characteristics (The 4 Cs) of every stone and work with you to find your perfect diamond. All Diamonds and Pearls Jewellery diamonds are graded using the Gemological Institute of America (GIA) grading system. Until the middle of the twentieth century, there was no agreed-upon standard by which diamonds could be judged. GIA created the first, and now globally accepted standard for describing diamonds: Colour, Clarity, Cut, and Carat weight. Today, the 4Cs of Diamond Quality is the universal method for assessing the quality of any diamond, anywhere in the world. The creation of the Diamond 4Cs meant two very important things: diamond quality could be communicated in a universal language, and diamond customers could now understand exactly what they were about to purchase. Diamonds are renowned for their ability to transmit light and sparkle so intensely. A diamond’s cut grade is really about how well a diamond’s facets interact with light and determine its brilliance. Simply put, the better a diamond is cut, the more sparkle it will have. A diamond’s cut is crucial to the stone’s beauty and value. And of all the diamond 4Cs, it is the most complex and technically difficult to analyse. To determine the cut grade of the standard round brilliant diamond – the shape that dominates the majority of diamond jewellery – GIA calculates the proportions of those facets that influence the diamond’s face-up appearance. These proportions allow GIA to evaluate how successfully a diamond interacts with light to create desirable visual effects such as brightness, fire and scintillation. 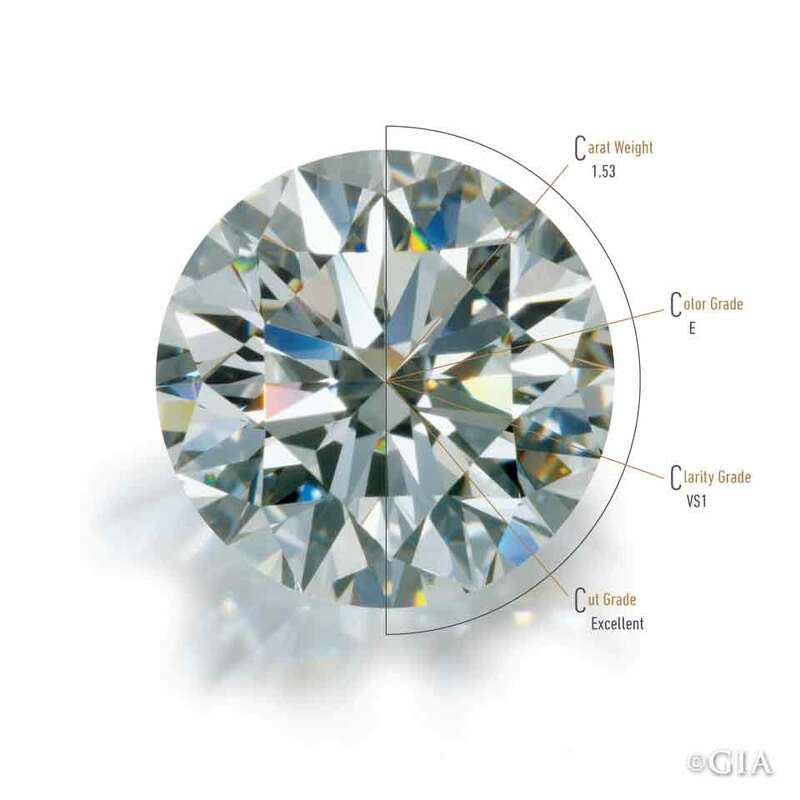 GIA’s diamond cut grade also takes into account the design and craftsmanship of the diamond, including its weight relative to its diameter, its girdle thickness (which affects its durability), the symmetry of its facet arrangement, and the quality of polish on those facets. The GIA Diamond Cut Scale for standard round brilliant diamonds in the D-to-Z diamond colour range contains 5 grades ranging from Excellent to Poor. As the name suggests, shape (round, princess, oval, cushion, pear etc.) describes a diamond’s form, primarily as viewed from above. All diamond shapes have different attributes, but overall the beauty of the individual shapes is a matter of your own personal taste. GIA’s colour-grading scale for diamonds is the industry standard. The scale begins with the letter D, representing colourless, and continues with increasing presence of colour to the letter Z, or light yellow or brown. Each letter grade has a clearly defined range of colour appearance. Diamonds are colour-graded by comparing them to stones of known colour under controlled lighting and precise viewing conditions. Evaluating diamond clarity involves determining the number, size, relief, nature, and position of these characteristics, as well as how these affect the overall appearance of the stone. While no diamond is perfectly pure, the closer it comes, the higher its value. The GIA Diamond Clarity Scale has 6 categories, some of which are divided, for a total of 11 specific grades. Many inclusions and blemishes are too tiny to be seen by anyone other than a trained diamond grader. To the naked eye, a VS1 and an SI2 diamond may look exactly the same, but these diamonds are quite different in terms of overall quality. This is why expert and accurate assessment of diamond clarity is extremely important. Diamond carat weight is the measurement of how much a diamond weighs. A metric “carat” is defined as 200 milligrams. Generally speaking, the higher the carat weight, the more expensive the stone. Two diamonds of equal carat weight, however, can have very different quality and price when the other three Cs are considered.